For details on Cannock Market and events please follow this link! Cannock and Rugeley have been holding markets since the 13th century when the original Royal Charter was first issued. The markets are situated in the town centres and offer a diverse range of products and services. There are currently 61 stalls in Cannock Market Hall, 27 stalls in the Prince of Wales and 45 stalls in Rugeley market Hall. 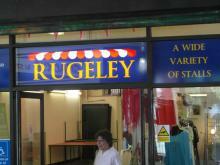 Stalls are available to rent on all markets, with some casual stalls at Rugeley too. There are number of pay and display car parks within Rugeley town centre, the nearest is the roof top car park situated directly above Rugeley Market Hall (Access to and from the car park is not suitable for wheelchairs or pushchairs. (Some car parks have height restrictions). Based on Ordnance Survey mapping (C) Crown Copyright. All rights reserved. Cannock Chase District Council, Licence No. 100019754, 2014. The Ordnance Survey map data included within this publication is provided by Cannock Chase District Council under licence from the Ordnance Survey in order to display where Rugeley Market is located. Persons viewing this mapping should contact Ordnance Survey copyright for advice where they wish to licence Ordnance Survey map data for their own use. Discounts available: 50% for first 6 months and 25 % for further six months. Please contact the markets team for more details. Unisex hairdressers. Appointments not always necessary. Contact Tracey. Specialist in Home Cooked Meats. Richard is now in his 40th trading year in Rugeley Market. Sweets, pop, crisps and biscuits. Does exactly what it says on the box! XMAS4KIDS CHAIRTY STALL (stalls 16,17 and 18). On site up until Christmas. Silk flowers, arrangements and bridal bouquets. For more information please visit our 'Becoming a market trader' page.